Balance, the notion that creeps into my daydreams. Balance, the notion that I put on a pedestal, the obtainable goal. I'm always striving for balance. Balance isn't something that should be chased, in my mind it should be achieved harmoniously. But still, I find my thoughts and sometimes my actions in the forever pursuit of balance. I can apply the concept of balance to every aspect of my life. Take for example the laundry. Piles and piles, chaotically strewn in front of the washer and dryer waiting to be dealt with is out of balance. Balance as one could equate to laundry would be a simpler ebb and flow, a load daily, a folded basket put away promptly each night. A morning not enduring chaos of digging clean clothes out of a pile or basket, balance. Odd socks creating an unsightly pile on top of my dresser shall be thrown out, only mates are balanced. Our First Laptop Lunch, A Success! A couple of weeks ago, I received a Laptop Lunch in the mail as a sample from the company. I've always believed in their products, but with our bento collection already established I had a hard time justifying purchasing another lunch box for my daughter. I can not tell you how incredibly delighted I was to pack the Laptop Lunch. Typically when packing a bento in the morning, part of the art is getting everything to fit in perfectly. 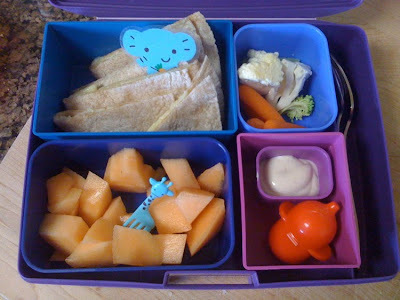 Which is a gentler way of saying, squeezing the food into the bento in a cute manner. But with the Laptop Lunch, everything fit wonderfully. I had lids for wet items and there was no squeezing or rearranging to get what I needed in the box. Here it a series of photos from the first Laptop Lunch I packed, including a photo from the end of the day! It was a hit. Now I think we need a couple more because that's all my daughter requests in the morning, her Laptop Lunch! 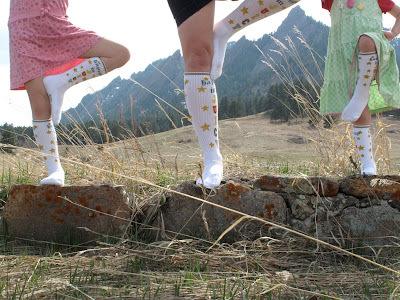 There's something about the Colorado sunshine that just seems to warm my soul from the inside out. A few weeks ago, the weather just magically turned into beautiful Spring. For some reason with the change of weather I've been drawn back to the mountains. 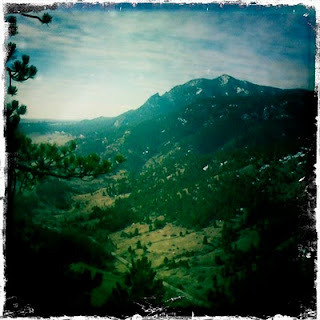 I've given into the lure of dirt trails, rocky steps, and picturesque views. Sometimes it's hard to justify an hour on the treadmill when mother nature created the most beautiful opportunity to work out right in my backyard. Vlog-My Food Revolution Test, Potato or Tomato? Back in September, Jamie Oliver updated his twitter account with a photo of his "Food Revolution, Hungington" hat. It was over six months ago, I eagerly anticipated the project he gave us small glimpses and insight into. Now the Food Revolution has taken off, by the way have you signed THE PETITION (which Jamie is bringing to DC to help him gather funding for school food reform in the USA)? I couldn't be more delighted over his success in America, as I've been a fan of Jamie for over 12 years. What he is trying to accomplish is an enormous undertaking and if you watch the show you can see his passion comes from the heart. 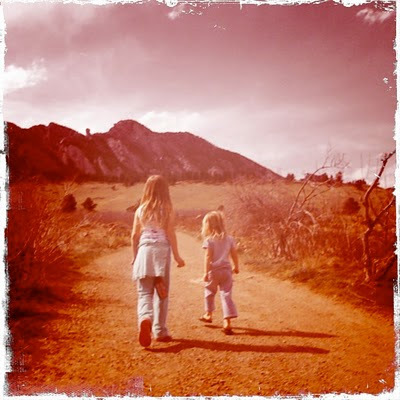 Wordless Wednesday: Hitting the Trails, Spring Has Arrived! 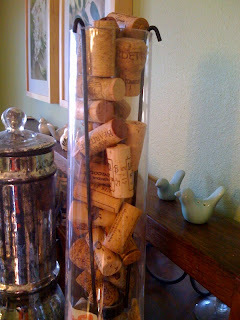 Tuesday Tips: Recycle Those Wine Corks Into Something New! By chance I have a collection of wine corks. When I say by chance, it always felt odd to me to toss away wine corks into the trash. Wine corks seem to tell a story or quite possibly spark a memory of one night. So instead of the trash, I'd stick the corks in a drawer. The drawer full of corks turned into a hurricane glass full of corks on display. Am I attached to my display of corks? In even better news, Whole Foods Market just announced this week they have partnered with Cork Reharvest to create a cork recycling partnership. What does that mean exactly? There will be boxes at all 292 Whole Foods stores in the United States where you can bring in your old wine corks. Only natural corks are accepted for the recycling program. Whole Foods will then ship the corks off to different locations where they will be recycled into something new, such as wine shippers containing 10% cork or cork floor tiles or turned into post-consumer products. Pretty cool, huh? If I Had An Extra $150... A Farm Dinner To Not Miss! School Food Project. I came across this and boy do I want to go. Who wants to sponsor me? This benefits the School Food Project which directly benefits my daughter's school district. 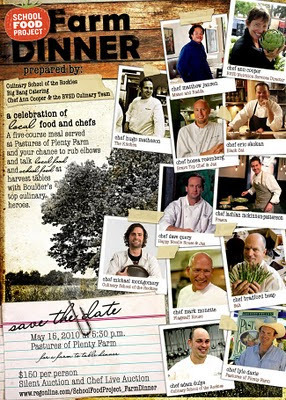 The chef line up is incredible, maybe the universe will align and I'll find a spot at a dinner table. Claude Monet, is known as father of French Impressionism. A Monet could be received many different ways, depending on the angle or distance from the actual canvas. While in the presence of a Monet painting it's best to step back, maybe even half way across the room to take in the feeling. As you walk closer and closer you see different details and the original image that was emblazoned in your mind, may actually be a grouping of broad brush strokes. 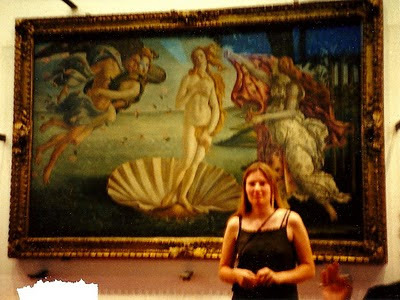 The entire feeling of the painting does change if you are just a couple of feet away from it. That's the beauty of impressionism. This morning I took a bit of a risk. I absolutely feel the need to pack at least two fresh fruits or vegetables in my daughter's lunch. Variety is key. When I opened the refrigerator, I saw a ziploc full of blanched fresh spring asparagus that was left over from dinner. 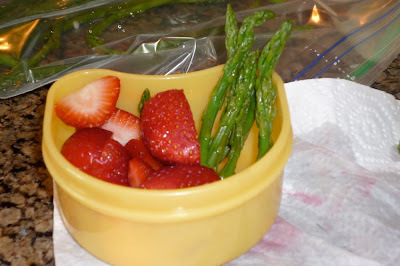 As I reached for the last four strawberries, I also grabbed the asparagus. I thought, why not let's see what happens. My daughter happily ate asparagus with her risotto two nights ago, but at lunch I'm not quite sure. So today is a test, an asparagus test. Sure does look beautiful doesn't it? I'll update a photo when she returns home from school. Anyone want to guess did she eat it or not? Hey ISP Here's How To LOSE A Loyal Customer!!! Three years ago, I signed up with an Internet Service Provider that was not a local cable company or my telephone company. I'm not naming the company because honestly it's not relevant to my post, if you want to put two and two together, go for it. When I signed up for my internet service, I was promised a speed of connection and I paid more money for that speed. I consider it tiered service, if your connection is 1.5 you pay $19.95, 3.0 you pay $29.95, etc. Maybe a year after I had been paying for a more expensive faster service, I came to learn that I actually couldn't achieve that speed at my location. I would do speed tests and screen grabs to prove I could not get the speed I was paying for. I felt miffed. First I would call India, then they would call the local guys to check on my location from the server/hub, it was an annoying vicious cycle. This morning I spent a few extra minutes snuggling the girls in bed, giggling and laughing even though the clock for school was ticking loudly. 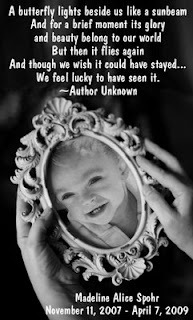 This morning, I remember a beautiful little girl that continues to touch so many lives. I only knew of Maddie from photos and her parent's words, but her smile was as gorgeous as the sun's rays and her eyes were an incredible clear ocean blue, her presence was joyful and mesmerizing. This morning my thoughts and full heart go out to Heather, Mike, and Annie. May the love of the world embrace you today like no other. Please go share some love with the Spohrs today. Also, you can help out another family with a premature newborn by purchasing a support pack, a wonderful gift to honor and remember and better yet, spread the love. 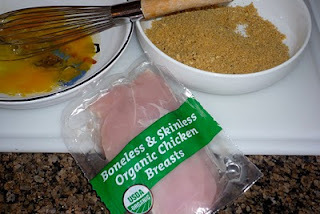 Tuesday Tips: Easy and Simple Gluten Free Breaded Chicken! Although my intention is always to plan a menu, grocery shop, and be prepared for dinner all week, that doesn't always happen. Somedays I look in the refrigerator at 4:45 and wonder what am I going to whip up? Yesterday, I thought I'll make some breaded chicken, fast and easy. Only problem, I was out of bread crumbs. Which means I had a few choices, to find an alternative or order take out. I opted to make it work and cook at home, I just had to get creative. Now while it is possible to toast some bread and stick it in the food processor that aspect felt a bit daunting for weeknight dinner preparation. Instead I ground up some Gluten Free Multigrain chips that were in my pantry to use as the "breading" instead. While we aren't a gluten free home, I did want to share the tip! Are You Serving A Happy Lunch? When I started packing bentos for my daughter, I was always surprised by what I found when I opened her lunch box at the end of the day. As you can see in the photo above, she did a great job. Often I forget to take photos of the lunch when it returns from school, I think what comes back is just as important as what goes into a lunch. If you are continually seeing the same half of a sandwich returned uneaten, it may be time to switch things up. 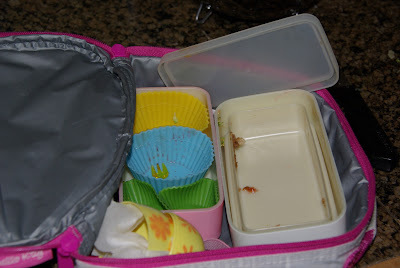 What was in my daughter's lunch that she devoured? Almond butter and jelly sandwich, cut into a bunny and flower. I used a couple of little pieces of strawberry to make an eye and smile on the bunny. The dot in the flour was a Smartie from the UK. On the side, fresh broccoli, strawberries, and some 365 (whole foods brand) cheese curls. For a treat, some Japanese chocolate biscuits. Reinvigorate Your New Year's Fitness Goals with a new Wii™ & Wii Fit™ Plus Giveaway!!! April started the second quarter of the year! Wow! Three months down, where has the time gone? I'm using the passing of time to reflect on my fitness goals I set for the New Year. It's time to reevaluate my goals and step them up a notch. My goals are typical, New Year definitely in a bikini by summer goals? Just kidding! Honestly one of my goals is to do something active everyday. My Wii Fit™ Plus has given me the opportunity to stick to that goal. Not enough time to make a yoga class, can't fit in the gym, the girls are sick, the weather outside is miserable? No problem, I'll just hop on my Wii Fit Plus! Today is one of the most exciting days at EatPlayLove. When I agreed to become a brand enthusiast for Nintendo, I was graciously offered a prize package to give away to my readers. 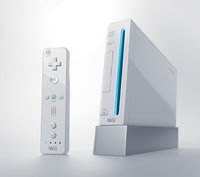 I'm giving away a Wii™ Gaming System AND a Wii Fit Plus game! It's Friday, Let's Have Music! They're Red Hot! The title inspiration for this post, came from one of my favorite songs! My daughter asked me for flowers for lunch. She was surprised when I said, flowers for lunch no problem. I love my set of Japanese flower cutters. They work wonders on harder vegetables, but today I used them to deconstruct a turkey sandwich for her. I have to admit she's a picky eater and loves to graze on a meal. Having the turkey, cheese, and bread cut up for her to put together herself in little nibble sized sandwiches was a hit. While I was at it, I cut up some flower shaped strawberries. I put the outside of the strawberries on the edge of the plate for no waste! I cut up some carrots to add as the flower stems. Here you have it, flowers for lunch! No bento needed, we were home. 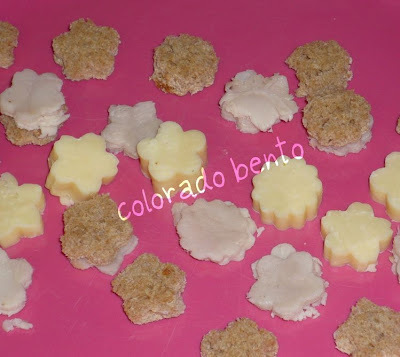 The cutters I use are featured in this post, they are stainless steel from Japan!